Home » Politics » A string of losses on campuses across India: Is the ABVP losing its appeal among students? 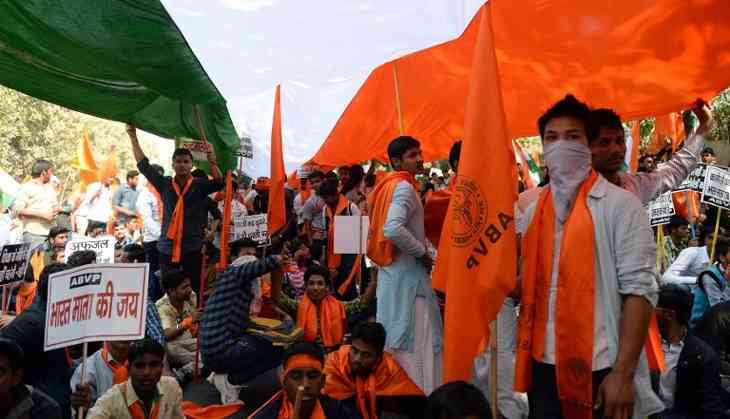 A string of losses on campuses across India: Is the ABVP losing its appeal among students? Things have not been going great for ABVP – is the BJP losing its appeal among students? Akhil Bharatiya Vidyarthi Parishad, the students' wing of the Rashtriya Swayamsevak Sangh, has lost key elections in recent months in various universities. This has alarmed the Bharatiya Janata Party, which has drawn a lot of support from the youth of late. So much so that the party reportedly formed a committee to figure out why the ABVP has slipped. The RSS is the ideological fountainhead of the BJP and the party has always gained handsomely from ABVP's support-base. In fact, key ministers in Narendra Modi's Cabinet -- including Finance Minister Arun Jaitley -- has been associated with the student's organisation. “The development was worrisome because ABVP is the nursery from where the party gets its next generation of leaders,” a senior BJP leader said. “I am not aware of any committee but if the ABVP has successively lost elections then it is natural to look for factors responsible for those defeats. The RSS must be seized of the matter,” he added. The RSS too did not confirm the formation of any committee but Rajendra, its Awadh Prant organising secretary, said the electoral setbacks would be analysed by the ABVP leadership. Also, In Bhadauria’s opinion, since they won one post in the Allahabad University Student Union (AUSU) election, it couldn't be termed a defeat. Besides, elections were not a priority, according to him. “We sent 70,000 to 75,000 ABVP members for a rally in Kerala. We also carried out a membership drive and recruited 8 lakh new members in UP alone. We work for the party’s bigger cause,” Bhadauria said. Everyone is not convinced though. The string of defeats shows that the RSS was not paying enough attention towards the wing, said Prof SK Dwivedi, an RSS ideologue and former head of Lucknow University’s political science department. “I am sure after Gujarat elections the causes of these defeats would be gone too,” he said. Dwivedi said that spreading the ideology instead of taking up issues related to students may have proved counter-productive for the ABVP just as raking up religion in civic polls is of little use. The campuses where the ABVP suffered setbacks included the prestigious Jawaharlal Nehru University, Allahabad University, Mahatma Gandhi Kashi Vidyapeeth University and the Gujarat University. The JNU campus, which has been in the eye of the storm ever since Kanhaiya Kumar, the then president of the student union, and two others were booked on sedition charges. The BJP, which has been using every possible trick to rid the campus of its Left ideology, was dismayed at the outcome of recent elections in which Geeta Kumari, an activist of All India Students Association (AISA), convincingly beat her ABVP rival by a margin of 464 votes. The right-wing student body was then rebuffed by Delhi University’s voters as it lost its stronghold to the Congress party’s National Students Union of India (NSUI). A string of electoral defeats for the ABVP followed. The outfit lost the Allahabad University Student Union (AUSU) poll to the Samajwadi Party Chhatra Sabha, which won four of the five seats. But more embarrassment was in store for ABVP as it first lost the Kashi Vidyapeeth elections in Prime Minister Narendra Modi’s constituency, Varanasi and then in election-bound Gujarat, where two independents won the central university’s student council poll. Even in far-off Assam, the All Assam Students Union foiled ABVP’s attempt to wrest control of the union in Gauhati University. TWEET THIS Things have not been going great for ABVP – is the BJP losing its appeal among students?